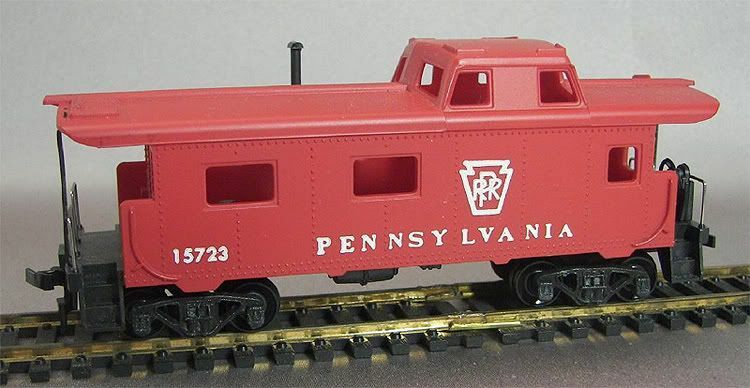 Note the images above suggest a variation exists for this TYCO New York Central Caboose. Some include the "Watch Your Step" and "Radio Equipped" lettering, while others do not. 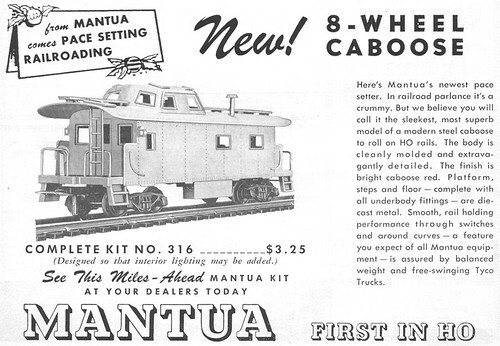 Above is a Mantua ad announcing the "new" Caboose model in December 1955. 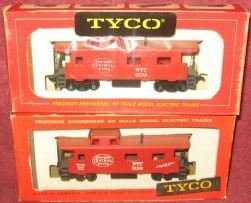 The 1960, 1961, 1962-63, 1963-64, 1964-65 and 1965-66 TYCO catalog lists the retail price of $3.49 for the 8-Wheel Caboose. A kit for the Caboose, #K327A thru #327Q, is found in the 1963-64 catalog for $1.98. The 1964-65 catalog's kit are #K327A thru #K327R and they are priced at $1.98 each. For 1965-66 kits, #K327A thru #K327S, are priced at $2.29 each. Notice the slight juggling of roadnames and numbers from 1961 to 1962-63. Canadian National, for example, is replaced by Canadian Pacific as the 'T327G' model. 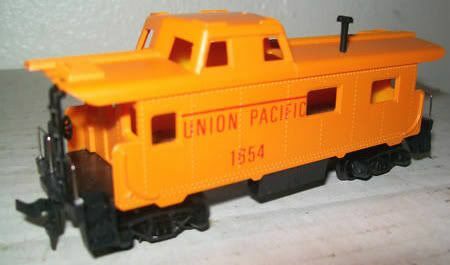 The CN caboose is then listed as 'NEW' as model 'T327N.' Also note the duplication of the use of model number 'T327S' as it serves in 1964-65 for the Atomic Energy caboose and again in 1965-66 for Atlantic Coast Line.